Are you the guru of gojis or a flax fanatic? Then you might be intimately familiar with some of these superfoods, while others might seems incredibly foreign and even downright bizarre. In their countries of origin, these berries, nuts, plants, and seeds have been used for thousands of years to holistically medicate the body or just add yumminess to everyday, wholesome meals. Experimenting with new ingredients makes life interesting and if the foods are especially nutrient-dense — even better. They are so high in vitamins, minerals, and other healing compounds that health experts call them superfoods. And while these are decidedly more exotic, there’s also plenty of everyday superfoods! Goji berries have a long history in Chinese medicine as being a cure-all. Repudiated to improve circulation and even enhance libido, it’s no wonder they’re so popular! But what Western medicinal science really tell us about them? 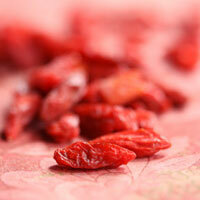 Goji berries are rich in many nutrients, and outrank prunes and blueberries in antioxidant load. They boast 18 amino acids, 5 essential fatty acids — including good sources of protein — just to name a few. While they can be costly — these little gems usually range from $6 to $12 dollars a bag which contains around 2 cups — you can always mix them with everyday super foods, or feast on foods that also have a really impressive anti-oxidant load for a lot less cash. 5 tablespoons of gojis contain 112 calories and 12% fiber along with 12% iron needs for the day. Remember that commercial from the 70’s, for the chia pet? “Chaaa-chaaa-chia” is the unforgettable jingle behind the grow-your-own garden on top of a piece of terra cotta pottery that forms the vegetable “hair” on the figurine. Did I just date myself with that one? Well, it was worth it since those tiny seeds are responsible for the lush green growth that can make us feel lush and vibrant as well. One of nature’s easiest things to eat, just hydrate chia seeds with warm water for a few minutes to allow the soft sweet jelly outside to bloom, much like tapioca. Or eat them dried, they are sweet and crunchy, and can even be added to breadcrumbs for a tasty chicken cutlet. They have an impressive array of vital nutrients, in fact it’s amazing that high levels of protein, omega-3, and fiber can fit into these tiny grey and white-speckled seeds. The best way to buy chia seeds is to invest in a one-pound bag that you can found discounted on the web for around $10. If you do decide to buy in bulk, store them in an air-tight container or zipper lock bag in the fridge to keep them fresh. Like many seeds and nuts, chia has natural oils that can turn rancid and ruin their delicate flavor. Get your day running with oats and chia for plenty of belly-filling fiber. 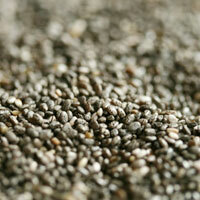 Get fit and stay fabulous after 40 with exercise and superfoods like chia. Are you already crazy for quinoa? If not, you’re about to meet your new favorite side dish. Quinoa, sometimes called a whole grain, is actually the seed of a green leafy plant that is still cultivated in South America. Revered by the ancient Aztecs as a source of energy for their fearless warriors, chefs and home cooks now admire it for its mild taste and creamy texture. I’m not done there, because there’s a lot more to love. Quinoa is a complete protein, and has all 9 essential amino acids, great for a vegetarian diet. It’s very high in manganese that helps keep bones strong and healthy, and normalizes blood sugar levels with its high fiber content. 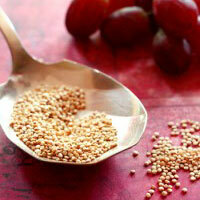 Quinoa also contains niacin, which has been proven to lower cholesterol and triglycerides. Looking for a more nutritious alternative to white rice? Quinoa is oh-so-easy to prepare, gluten-free and easy to digest. Try my quinoa risotto or quinoa crusted chicken fingers for your loved ones tonight. Or try rrevamping your breakfast tomorrow morning! Love going out for sushi and digging into lightly steamed edamame pods topped with seasoned salt? Me too! Now you can make them a part of your home-dining ritual since edamame are available in the freezer isle in most health foods stores. Edamame (fresh soybeans) are packed with low-fat protein that’s rich in calcium, vitamin A and C. Edamame is a better, safer way to enjoy soy since they are a whole food and aren’t processed like packaged soy foods and snacks that are marketed as health foods. 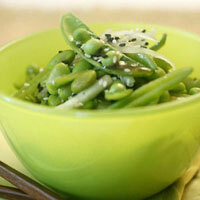 Including edamame in meals is so easy, you can add them into any bean dish, like burritos, soups, and dips. This edamame salad is especially good during warm weather or served alongside a flaky piece of white fish or with short grain brown rice. Flax fanatics will tell you that this high-fiber seed fills out their smoothies and can help them feel fuller, longer. Heavy with omega-3 fatty acids, just 2 tablespoons a day can give you more that 100% of your recommended daily value, although absorption is low. Let me explain. Flax is mostly made up of alpha-linolenic acid (ALA) that isn’t well converted compared to those docosahexaenoic acid (DHA) and eicosapentaenoic acid (EPA), found in fatty fish. That said, you can still reap some of omega-3 fatty acids in flax that promote bone health, work as mood enhancers, and decrease inflammation (that may cause conditions such as asthma, osteoarthritis, rheumatoid arthritis, migraine headaches, and osteoporosis). Studies show that flax can even help to control high blood pressure, and has been studied for its ability to lower cholesterol (because flax is so fiber rich). 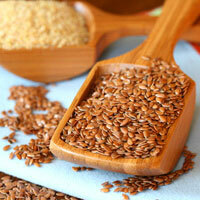 2 tablespoons of flax contain 74 calories, 132% ALA omega-3’s and 15% vitamin B1 of your daily needs. Switch up your breakfast this fall and winter season with my hot oats and flax. Think of turmeric as the bad boy of spice. He’s tart, powerful, and has many talents including the ability to soothe skin disorders like psoriasis, calm the nervous system and PMS, and even potentially fight cancer (because of its active ingredient, curcumin, which works as a powerful anti-inflammatory). 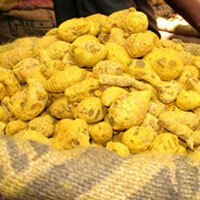 There is fascinating research that also shows turmeric might suppress fat tissue growth. So will you swoon when you taste turmeric for the first time? Probably not, since turmeric has a stringent, tart flavor that’s hard to love despite its rockstar qualities. However, using it in small amounts in your favorite recipes is easy since it comes in powder form. And if you’re a curry fan then turmeric (that gives curry its characteristic bright yellow color) is most likely already in your spice cabinet. Try adding a teaspoon of turmeric the next time you make chili or sprinkle some on a fresh mango with a squeeze of lime, then throw it it on the grill. Or, this weekend, have a movie night and serve spiced popcorn. Or for a fast no cook treat, stir a 1/4 teaspoon of ground turmeric into fresh squeezed orange juice. Dandelion made the list as an exotic superfood, because many people would never guess the humble weed growing in their back yard is a powerful detoxing agent. The French are well aware of its diuretic/cleansing properties, and they call it “piss-le-lit” or “wet-the-bed”. In folk medicine, dandelion leaves are consumed in the spring to rid the body of built-up toxins stored in the body from eating heavier foods and moving less. 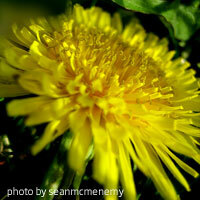 Ayurvedic doctors recommend eating dandelion leaves to protect the liver, kidneys and gallbladder. 1 cup dandelion leaves has 25 calories, and contains 112% of your vitamin A and 32% of your vitamin C needs for the day. The root of the maca plant has been used in indigenous Andean cultures as a source of nourishment and healing for many millenniums. A small hard root, it reminds me of a turnip — it’s one tough customer to live and thrive in the rocky earth of the Peruvian highlands. Maca has an interesting and rich nutrient profile — containing amino acids, vitamins B1, B2, C, E and minerals including calcium, phosphorous, zinc, magnesium and iron. It is a good source of potassium (which is vital for controlling our blood pressure and water balance in the body). 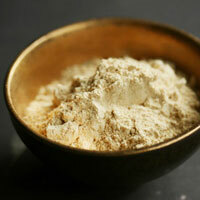 You can find maca in powdered form and it blends beautifully into smoothies. I think it tastes like malted milk powder and makes a great malted chocolate smoothie by adding it to milk, bananas, unsweetened cocoa powder along with a bit of stevia. Camu Camu, an Andean berry, grows on trees planted in the Andean swamps. It takes 100 pounds of berries to make 4 pounds of dried camu powder, so no wonder the stuff is costly. But it certainly packs a serious vitamin C punch, containing 30- to 60-times more vitamin C than an orange! It’s full of flavenoids, powerful antioxidants that give it its unique flavor profile that reminds me of cranberries crossed with citrus. 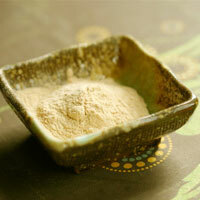 It also contains several amino acids and B vitamins giving it a variety of nutrients. As a folk remedy, camu camu has been used as a cure-all: as an anti-depressant, anti-inflammatory, hair tonic and an anti-viral remedy. Healthy living experts say it shows potential to balance brain chemistry and moods, but there are no current wide-scale studies available. 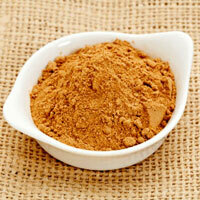 Camu powder can be added to cold drinks, smoothies and even stirred into ice cream. But remember that a little goes a very long way. 1 teaspoon give you over 1000% of your daily recommended needs for vitamin C. I make a camu camu spritzer by adding 1/4 teaspoon to 8 ounces of chilled sodium-free seltzer. Lucuma is considered a healthy sweetener because it is made from a fruit that contains a wide array of nutrients, including B vitamins, fiber, calcium, niacin, and iron. While it does contain carbohydrates and calories (60 calories per tablespoon), it is low in sugars. In powdered form, lucuma has a wonderful maple flavor that works well in puddings and would be excellent for sweets that are vanilla, banana, nut or chocolate flavored. I use 2 teaspoon for every tablespoon of granulated sugar when converting dessert recipes that are high in moisture content like pudding, smoothies, and warm drinks like hot cocoa. Looking for local superfoods that are hanging out in your local grocery store? Read up and get my list of Top 10 Everyday Superfoods.